Pic: Yeah, you WISH you were this talented! Flopsy's progeny, Generic Peeper, at bottom. It's been unseasonably warm this Fall/Winter, and I'm doing my best to take advantage of this fact by catching up on odd projects. For example, the photo left shows the goose hutch, recently modified by adding new left and right openings. 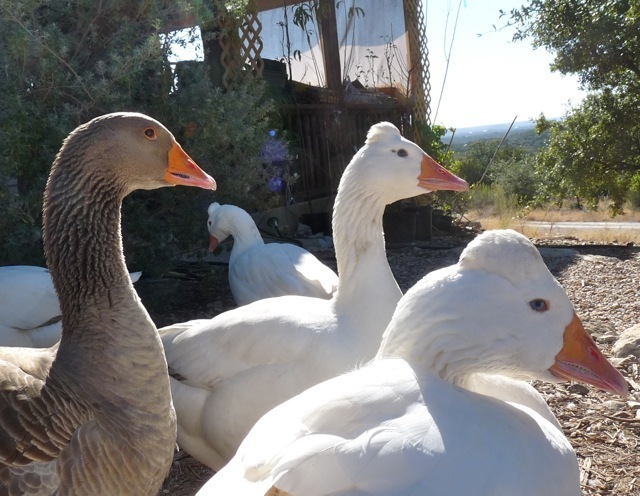 Our geese like to have a clear view out, and the hutch as it was before would rarely be used by more than one goose. Hopefully that will change. Cutting out the new entrances was my first experience using a circular saw doing unguided "plunge cuts" (kids, don't do this at home -- or at all). The result looks a little like something out of a Dr. Seuss book. The geese, opinionated though they may be, have never had anything to say about architecture. Thankfully. Pic: Left is Gertie, middle is ?, right is Billy-Bob. 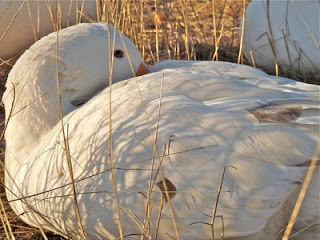 The geese should start laying eggs any time now, but there's no sign yet that they're even thinking of doing so. Last year they started dropping eggs by Winter Solstice. This year? Not even a hint of territorial crabbiness. No pairing for "snuggles" in the Pool of Woo. No cheering on of others "snuggling". Nada. We've lost four geese this year - Godzilla, Princess, Gina, and Miss Cecily - and have gained a new Buff Pilgrim goose, adoptee "Purdy" Gertie. I've been wondering how Billy-Bob, the lone gander, is going to handle having a whole harem to himself. I'm sure he's not worried. 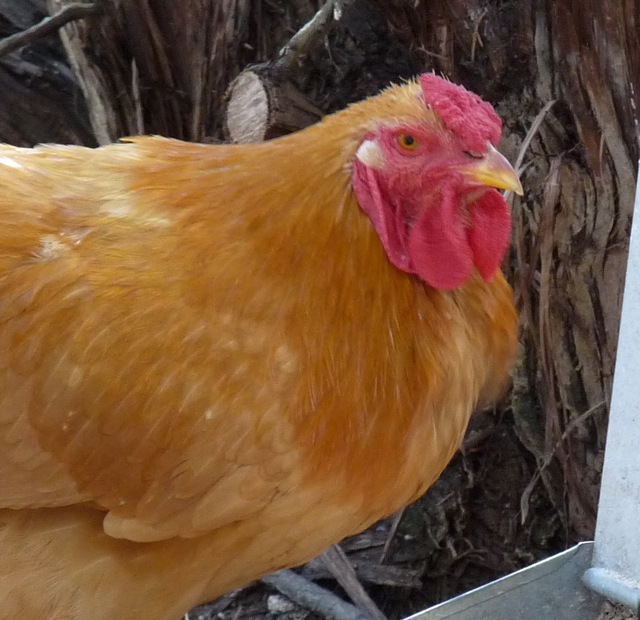 It's that time of year when the hens slow down their egg-laying proclivities - the less light available during the day, the more they slow down. 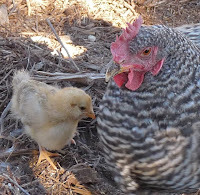 Commercial farmers get around this by using timed, artificial lights to keep the production high, but the drawback is this method also shortens the lifespan of the hen. Not something I'm interested in doing, as most of our hens are pets. [There, I said it, I admit it. If it wasn't blatantly obvious, I love our squawky, fussy little fuzzybutts.] Thankfully, our girls are still laying enough eggs to sell through the co-op and to individuals, which in turn buys their organic feed (and a bit more to make up for those slacker geese). Fall or Winter is also a good time to de-worm. The problem with the usual deworming method is that it requires you to destroy any eggs laid during the deworming process. Pretty intense chemicals are used. On one hand, you KNOW that the girls are going to emerge from the process "clean as a whistle" when using these chemicals. On the other hand, I wonder if such heavy-duty chemicals are really necessary every year, unless there's a major infestation*. So this year, I'm trying out Verm-X and pumpkin seed smoothies. You can read more about Verm-X at their site. 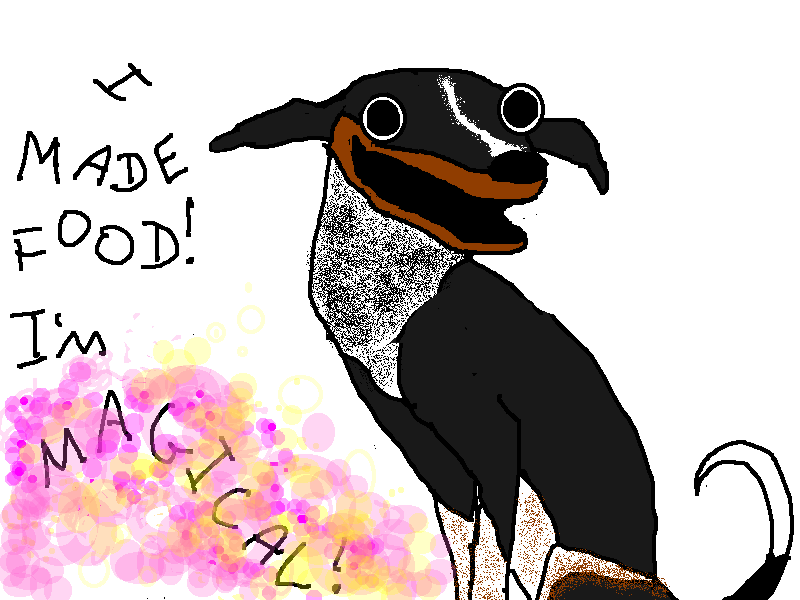 Basically, Verm-X is an herb/spice combination that is supposed to have deworming properties. You can get it in liquid form, or feed pellets. One challenge, however: the girls drink and forage in so many places that I can't guarantee they're ingesting enough (or any) of the formula. 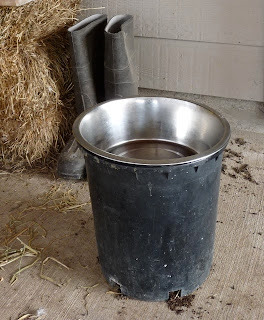 Tried soaking bread scraps in the liquid Verm-X as an alternative suggested by their site, but the girls wouldn't touch the stuff - it has that potent a scent! After chatting on Twitter with a couple other hen-addled folks, came up with a solution: pre-soak scratch grains in Verm-X. This gives the Verm-X time to "off-gas" some its scent, making it more approachable. 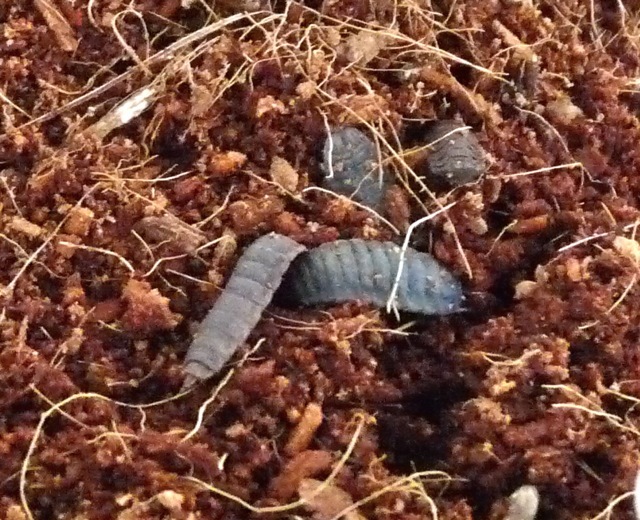 The girls are now eating the grains. 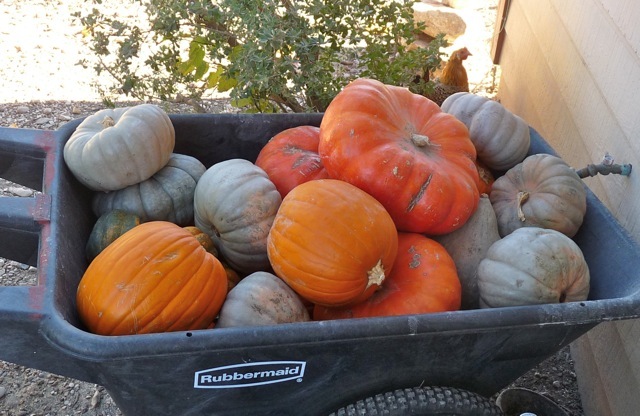 I also took home a bunch of free pumpkins from the garden nursery a few weeks ago -- one person's old Fall decorations are another person's home canning project -- of which the pumpkin seeds can be used as a dewormer. Grind fresh seeds in a food processor with some unsweetened bio-active yogurt, and serve. This recipe is what the girls REALLY love. Figure I'll make this smoothie recipe for the remainder of the six-week de-worming process (the Verm-X will run out before then), and see how it goes. Supposedly back in "ye olde days", those who worked with animals on farms were also encouraged by country doctors to do a regular de-worming regimen (and of course, I can't find the links where I first read this). There are plenty of herbal parasite cleanse methods available to humans over-the-counter. It's been three years of owning animals, so I'm thinking it wouldn't hurt if I were to do one as well. And thankfully, I don't need to worry about throwing out my own eggs. Oh yes, in a New York minute. It will be a few months yet before the new ducks start laying eggs, but when they do, this particular breed can lay at least four eggs per week, oftentimes more. Whether we can gather that many eggs to sell is dependent on how quickly we can find them on the property before Maggie does. Since we've tightened up the entrances to the hen house, Maggie no longer has easy access to the laying boxes, and has missed her daily egg snack. Woe was Maggie! She finally figured out, however, that the eggs the one mature duck lays - Moe - are NOT those fake porcelain eggs we put into the egg boxes to encourage the chickens to "lay local". They are quite an acceptable substitute. It's a race in the mornings between canine and hominid to find Moe's latest laying spot. Moe likes to keep us all guessing and switches up her laying spots often. "Is there something you need? No? Then please to be leaving now." "Careful there, cowgirl... I peck hard!" Buster, aka Butch, aka "@#$! rooster!" From the coloration, I'm thinking Buster is the father. Not quite sure if this is Flopsy's biological progeny, as I didn't check the color of the egg she was sitting on, and there was no leftover shell that I could find after the hatching. 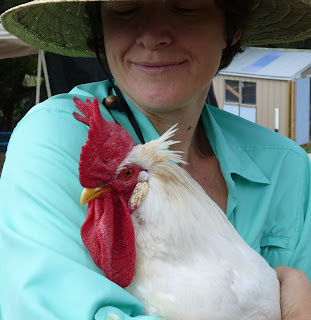 I'm very happy that Flopsy was successful, as I hope to have our hens brood and raise any new chicks in the future. 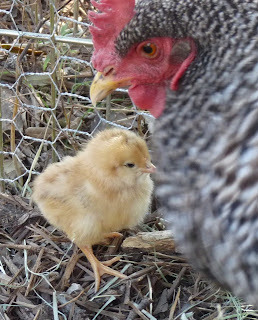 Of a few rare breeds I'd like to try, it can be easier to get fertile eggs instead of day-old chicks. 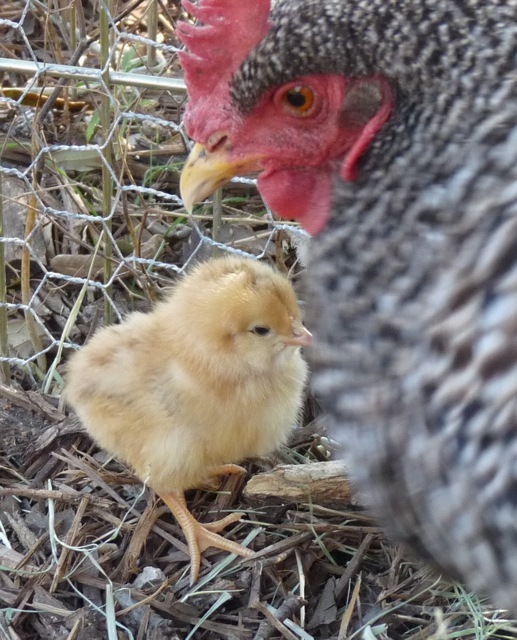 Plus, having a mama around to show the chicks the ropes, keep them warm, clean any pasty butts, etc. - I'm all for it! 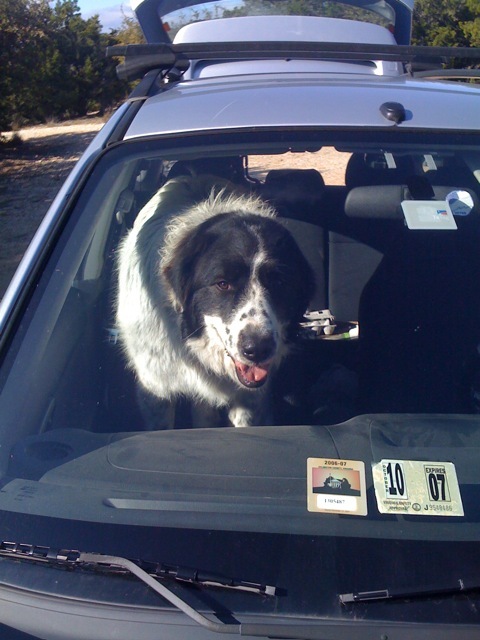 Hyperbole and a Half: Dogs Don't Understand Basic Concepts Like Moving. Seriously, I laughed until I cried. Her graphics really capture the story. If I need catharsis for any reason, I'll go read one of her entries. Made this recipe recently, and love it soooo much I wanna crochet a sweater for it: Cider-Braised Kale with Sweet Cherries. I ate the contents of the entire pan. Getting ready to re-build the compost bins. The chickens have become very adept at getting into the compost contents, leading to more compost laying about the bins than inside the bins. 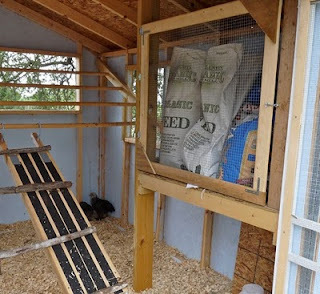 Will continue to use pallets, but will line with chicken wire to keep the girls from pecking the contents out from between the pallet slats. 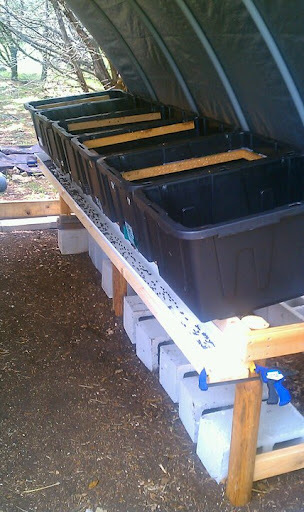 You can find different ideas for putting together pallet compost bins online, like, here. 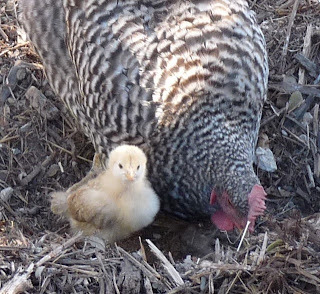 Coming up soon: pictures of our Barred Plymouth Rock hen, Flopsy, and her new baby chick. 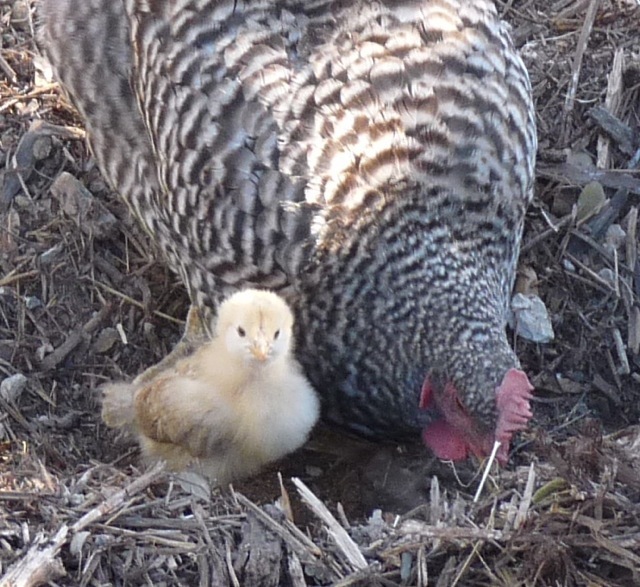 Yay, another successful momma in the flock! ...just received three-figure dollars worth of surgery yesterday. 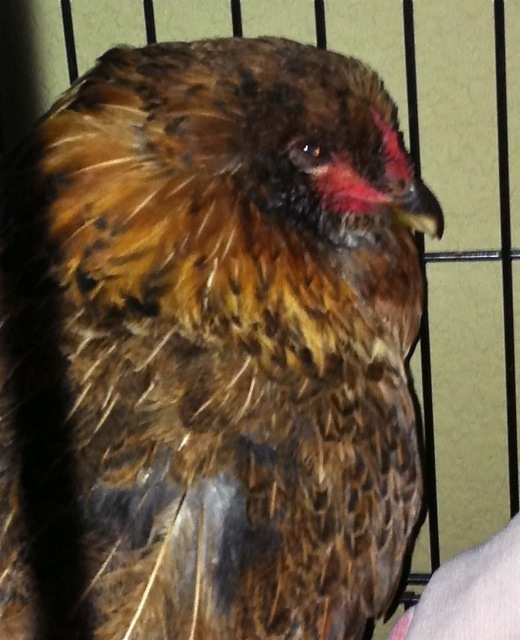 Red, the Ameraucana hen, is a pet. 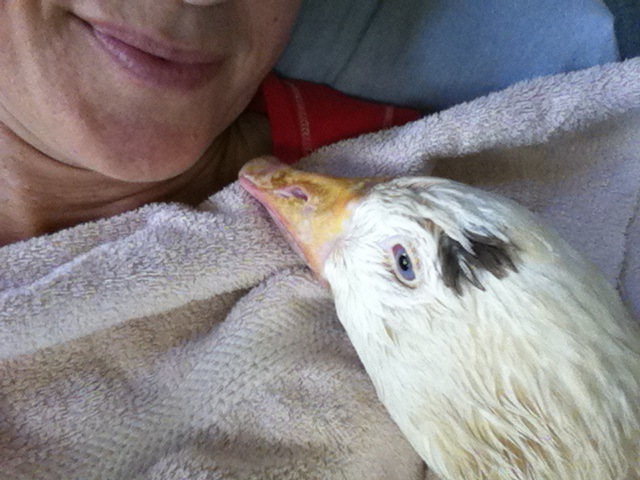 She's a bit addled - she thinks the geese are big roosters - but she's scrappy, and lets us pick her up and snuggle her. So when I picked her up the other day and noticed a foul smell and the golf ball sized lump of her crop, I knew something wasn't right. Research narrowed her symptoms to a sour and impacted crop. Brought her inside the house and tried some of the suggested home remedies, but the crop wasn't getting any better (nor the smell... yeesh). Called the vet the next day, who took Red in immediately. Lavaging her crop wasn't budging the contents, and so they asked - and received - permission to open her up. Red had stuck in her crop: her regular feed, grasses, larvae, seeds, grains, bugs, other greens. She's definitely got a varied and healthy diet! What has caused the lack of crop motility is now the question of the day. 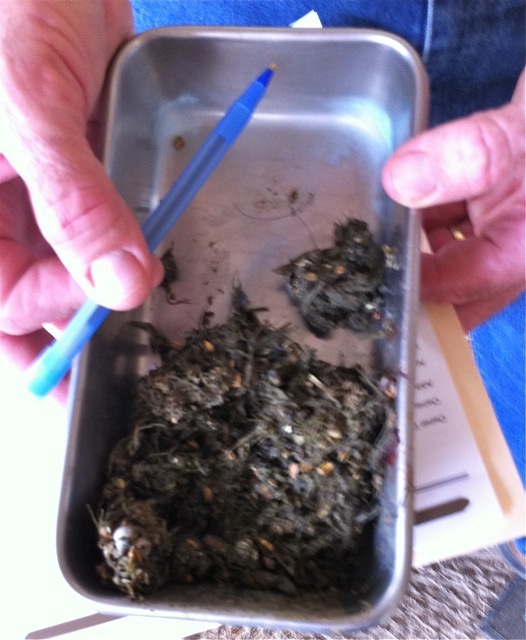 There were a few flagellets found in samples taken from her crop, but it's hard to say for certain what's going on. In the meantime, she's our housemate for the week. She needs some time to recover from the surgery, grow in some feathers on her chest where she was shaved, and receive regular medication. On the list: antibiotics, de-wormer, and other anti-parasitic drugs. Soft cat food with probiotic powder to help her gut achieve balance again. Electrolytes in her water to help rebalance any possible dehydration issues. And hopefully getting some rest, which means holding back much fussing on my part. 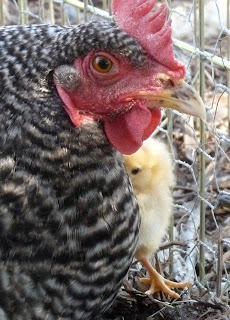 Get better soon, lil' chicken gurl! 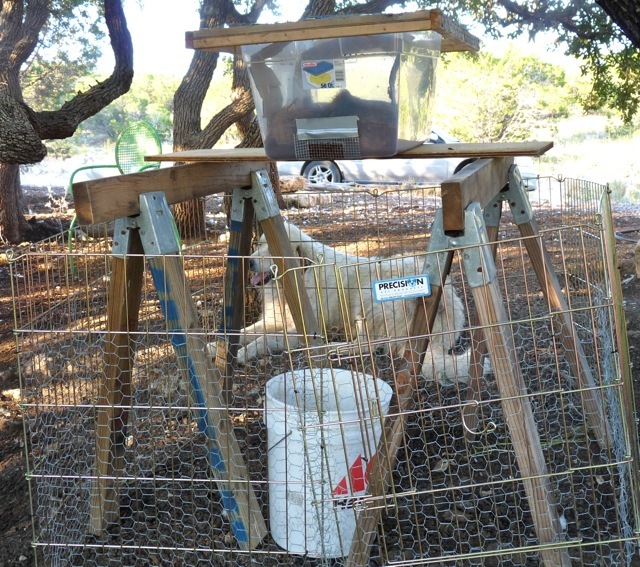 Emma is a bit arthritic, and so the thought was to build a feed stand* for her. Having the dog food bowl a bit higher would be easier on her shoulder joints. 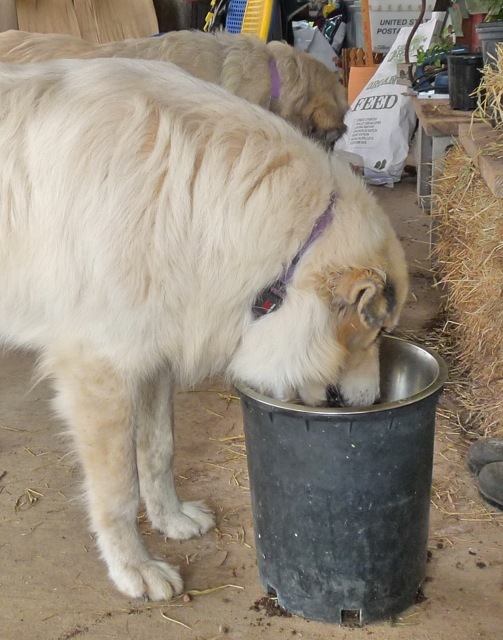 Then, of course, we'd need to have feed stands for all the dogs, as we wouldn't want any jealousy going on during the morning chow-down. Happy discovery: the dogs' current food bowls fit perfectly atop five-gallon plastic plant pots. The bowls, with lip, measure about 11 inches across, and the plastic pots slightly less (so as to support the lip of the bowl, natch). The pots stand about a foot tall. While these pots were left over from recent plantings, you could probably pick some up for free or spare change at any garden nursery center that recycles their plant containers. Throw some rocks in the bottom of the pot for stability (or bricks, or whatever heavy refuse you have laying about) and voila! Feeder stand! I started finding eggs in the night pen a few days ago. 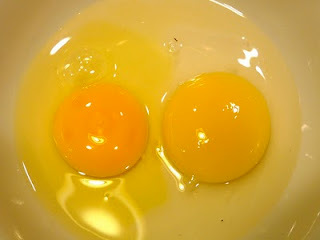 They were big hard eggs, left in the middle of a soft green weed patch. First thought was perhaps the dogs had poached the ceramic "dummy" eggs out of the hen boxes, and upon discovering the ruse, dropped them in disgust. (Ha! Rotten dogs). After picking up a total of three eggs over the course of a week, I started getting curious, as most of our dummy eggs are now marked with blue dashes (so as to easily see the difference when gathering from the laying boxes). I finally cracked open one of the mystery eggs tonight. 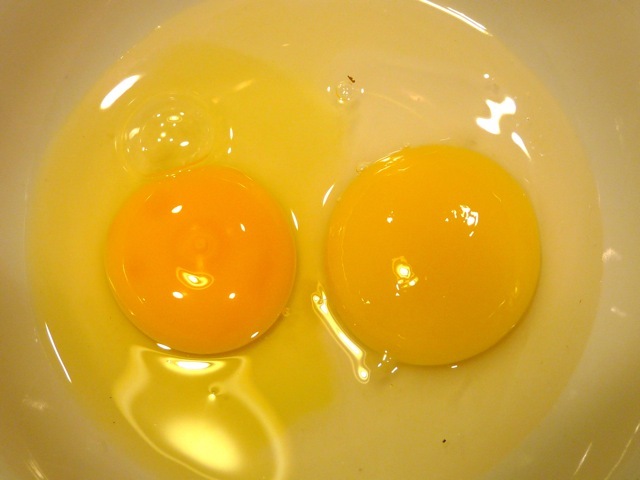 Spouse suggested cracking open one of the largest hen eggs on hand, and compare the yolks side-by-side. I think it's safe to say that yep, the mystery egg is a duck egg! Woo-hoo!! Little brown fuzzballs of attitude and cuteness. They arrived the day after Miss Cecily was euthanized, as if Miss Cecily and the Universe knew what was about to happen, and conspired to keep me busy. The ducklings have moved from house pen, to porch pen, to yard pen in two short weeks. They are messy, messy, messy. I love them to pieces. One week old, and first day in the Big Blue Room. 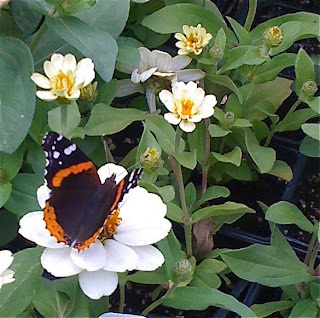 @virgotex remarked "What are you doing, feeding them MiracleGro?" 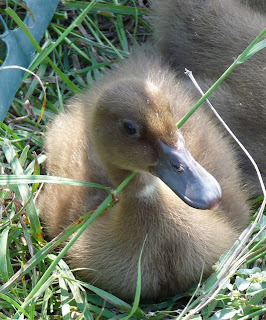 Nah, just organic duckling chow. Thank you McMurray Hatchery! And then Michelle asked in the comments section "You don't mention what kind of ducks they are... inquiring minds want to know these things :)" Well, that's just the mind-bending power of cuteness overload, Michelle - one forgets to mention these things! 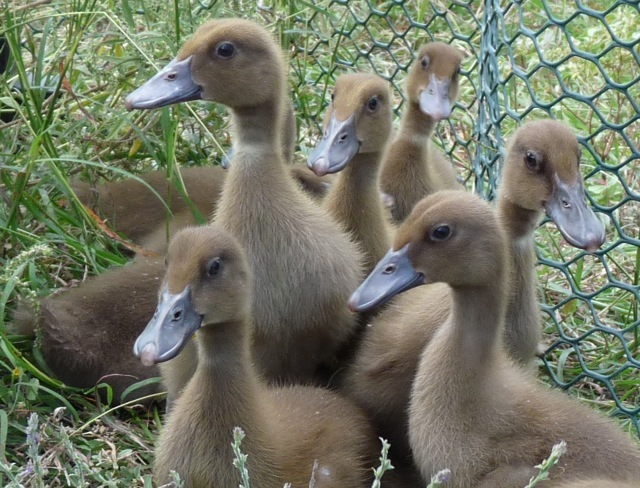 These little squeezlings are Khaki Campbell ducks. 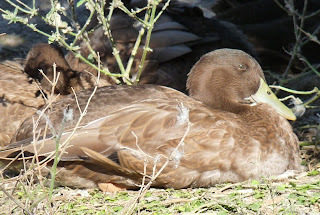 They're to keep Moe, our recently rescued (and lone duck) company. 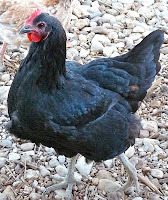 This is what Miss Cecily, and one other animal on the Big Softie Ranch - Hoppy the Chicken - had contracted: Avian Leukosis. 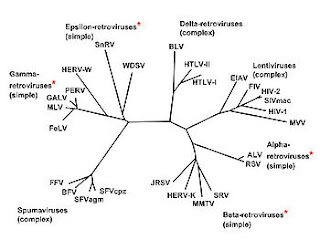 It is a vertically transmitted virus, from infected mother to embryo chick. Miss Cecily's body was riddled with these tumors. All her major organs were affected (especially her liver), and her skeletal muscles as well. There is no cure. It was a minor miracle we kept her alive for this long. 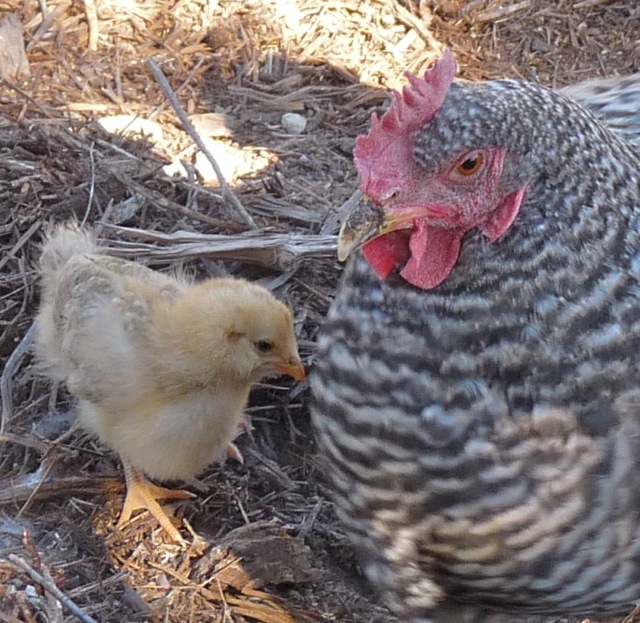 With two separate birds/breeds post-mortem diagnosed with Avian Leukosis, this means the poultry breeder from whom we bought these girls has some problems. To be fair, however, no breeder is completely free from this issue. 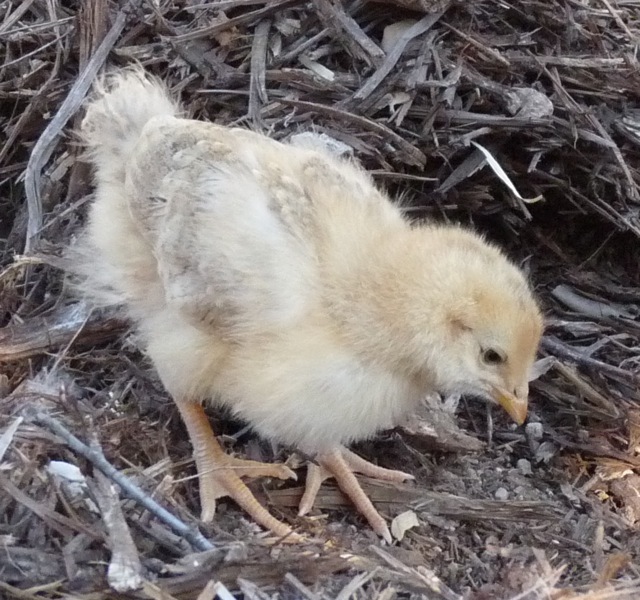 There's no way to tell if a young bird is infected other than biopsy. Regardless, because of other problems we have encountered with birds from these folks, we have already started buying from another breeder. Photo: a retrovirus, courtesy of The Full Wiki. She couldn't pick herself up from the floor. If I was able to help her onto her feet, she was at most able to take three steps before she was back on the ground again. I was helping her stand to drink water, to move around. Her eyes were still bright and alert, but the rest of her body was no longer willing to continue. 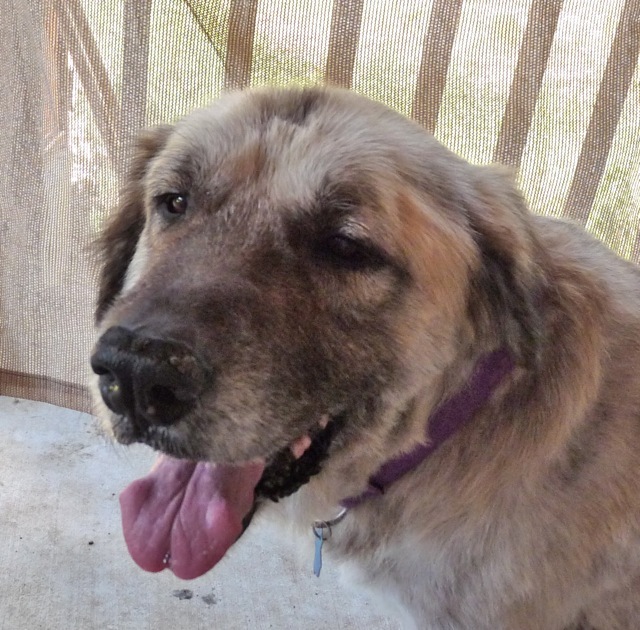 It was a hard decision, but in the end, it made sense to have her euthanized. I know, I know - for animals, the term is supposed to be "put down", but you know what? She'd become such a part of this family that I just can't use that term. My apologies to the purists. 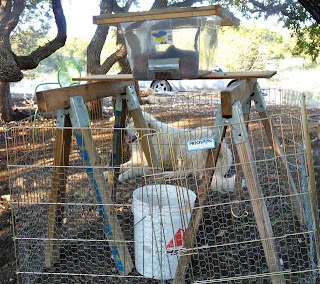 (supposed) anti-goose barriers for the dog beds. Spouse said that I always doted on Miss Cecily, even when we first got her as a gosling. Something about the tilt of her eyes, her Very Small Tuft, her calm demeanor, her insistence on sleeping on the dogs' beds, always finding a way around or under any obstruction we'd put in place. How she and Godzilla were sweethearts, even though Tufted Romans are harem-minded by breed. And in the house: how she'd grunt in front of the refrigerator when she wanted greens, or would stand by the stove when she wanted her smoothie. Then how she'd tug on the hem of our shorts or pants, as if stamping her foot impatiently, while we got her food ready. And don't you dare forget to let her have her daily nap on your chest. If you missed the regular nap time, she'd stare you down with those beautiful, beady blue eyes until it felt like a laser piercing your skull. Must. Obey. The Squeezle. to say "dude, you're doing it wrong..."
We're having her autopsied to see if some sense can be made of what she went through, in hopes it can help other birds in the future, and I'll be sure to post results here as well. We can't get her intact body back, but can get it back cremated, so that's what we'll do. Some have said that very few people would have gone to the lengths Spouse and I did to keep Miss Cecily going, in hopes she'd heal from this strange malady. I don't believe this makes us either heroes or fools - it's simply something we did for a beloved pet who gave so much to us. I daresay others would have done similar. 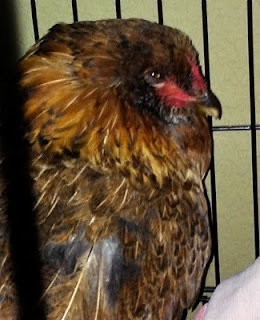 I found a bit of her goosedown on the floor today (amidst many other feathers, as she was going through her Fall molt). In time it will be put into the compost bin, like all things, even eventually our own sweet selves. For now, however, it's on my desk. I pick it up and give it a kiss now and then. Much love to you, Sensei Cecily, Guruji Goose. You taught me so much about life, illness and death. 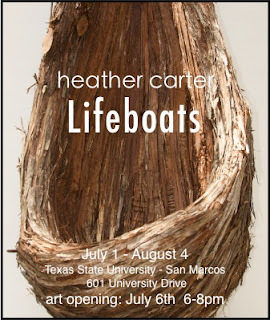 Sweet breezes and fair journeys. "There's a little word I'm gonna teach you", my neighbor said. "It begins with the letter 'N', and ends with an 'O'." 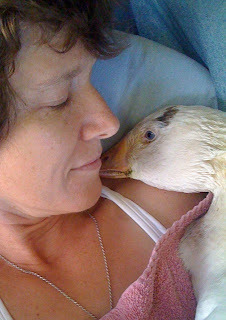 But-but-but.... it was an abandoned pet goose! With a duck buddy!! How could I say 'no'? I imagine my neighbor would snicker, then patiently attempt to show me how to shape my mouth to make those sounds. 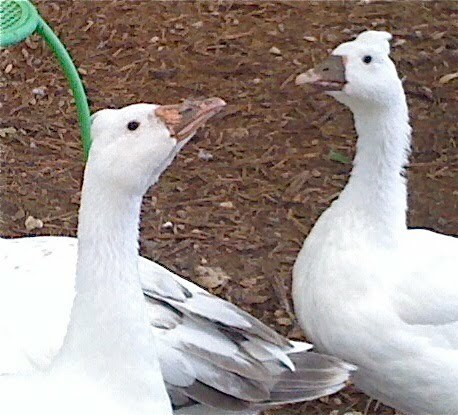 With that said, let me introduce two new additions to the Big Softie Ranch: Gertie the Pilgrim Goose, and Moe (short for "mohawk") the (as best I can guess) Crested Khaki Campbell Duck. We've had them for about a week now. 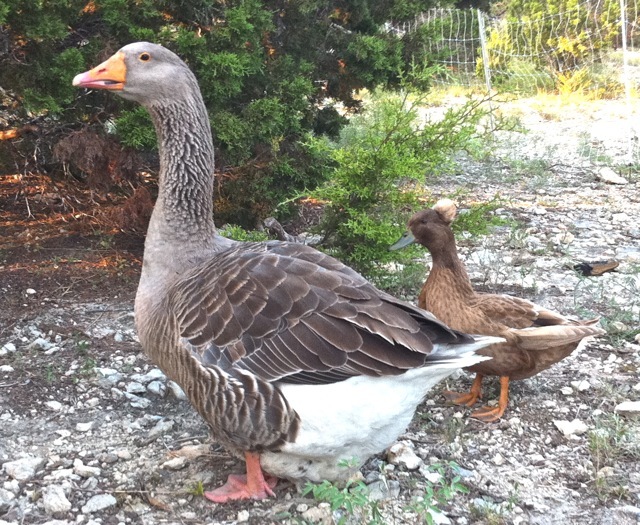 Gertie is slowly winning over the crabby geese already on the property, starting with Billy-Bob the gander (of course). 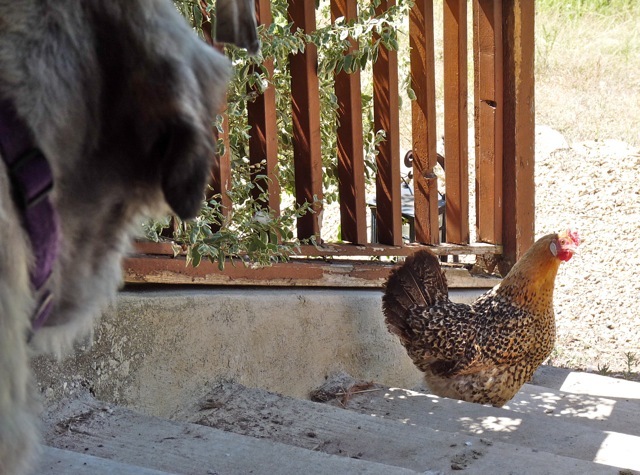 Moe is getting to know the chickens a bit better, and is no longer stuck like glue to Gertie's side. 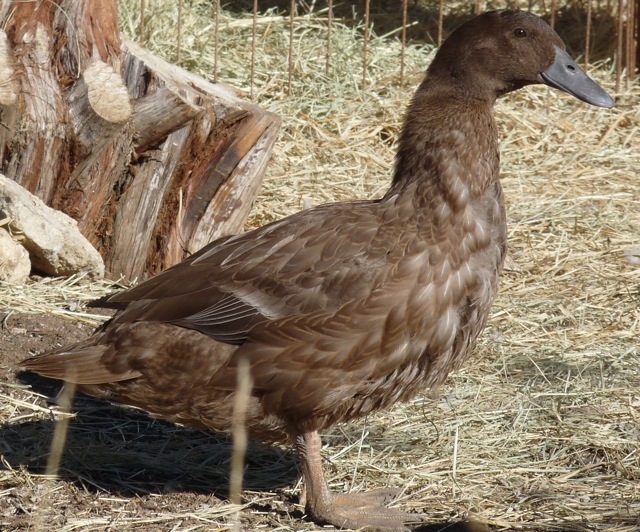 Lest Moe have problems with species-identification issues, we've ordered ten more Khaki Campbell ducklings to keep her/him company. You know, because it's not right to have one of any particular animal on the farm. Yeah... (ahem). 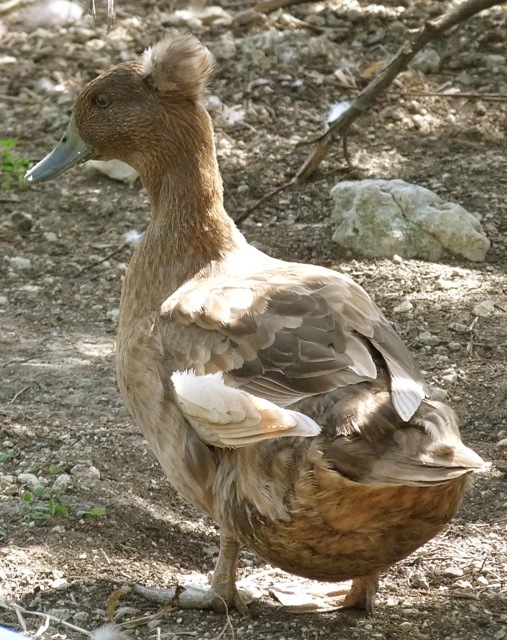 Besides, getting the new batch of ducklings will get Spouse and I off our backsides to finish up the Gooselandia pond. What was going to be an in-ground stock tank has now morphed into a small, slope-sided pond with fish-safe pond liner. We'll throw in some minnows and goldfish to keep the mosquitoes and algae down to a minimum, and... what? Speaking of "no" and lack thereof, Emma the adopted dog is now definitely "one of us". She proved it by refusing to budge from her napping space, forcing me to work around her as I finished installing lattice on the side porch for the evergreen wisteria. Just like Maggie and Bandit, she figured I'd work around her. Yep, one of us! "My, what big teeth you have Grandma!" I thought as I was giving Emma a look-over a few days ago. Not only are her teeth bigger than our other two Great Pyrenees, but her paws are larger as well. 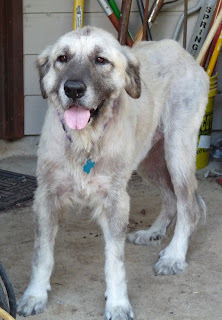 Online research has found that between her Anatolian genes and the Great Pyr genes, she could get up to 130 pounds. Holeeeee smokes! That makes now the time, while she's still under-weight, to get any lessons on submission done. Emma, as she's coming out of her shell, is showing herself to be very playful, energetic, and curious in the mornings. Not that this is bad, it's just a bad combination while she's tailing me on the morning chores. 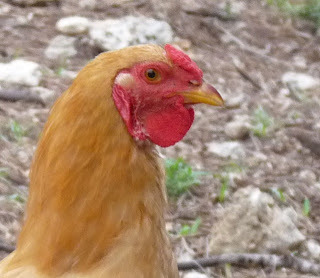 I'd open the coop doors, and Emma would want to sniff, pounce and chase those fluffy, squawky things around. Uh-oh, not good at all. Firm orders of "no!" 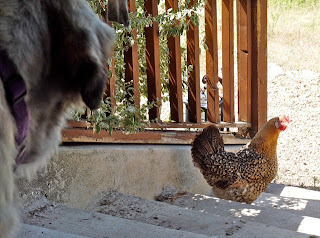 were unheeded, and distractions didn't last for long, so it was time to make her Submit to the Chickens. I picked up one of the more docile hens - a fluffy Brahma. Then I grabbed Emma. Underweight though she may be, it took all of my weight shoved against her to bring her down, and even with my 155 pounds it took a good thirty seconds of wrestling to get her onto her side: one arm around Emma, trying to get leverage, and one arm holding the (now very annoyed) chicken. Emma still has her spirit, I'm happy to say. She did not submit quickly, but she did "get it" once she was down. 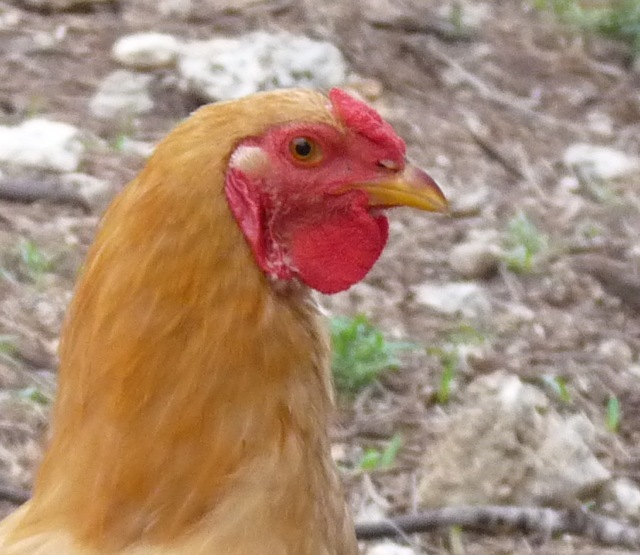 She relaxed, I kept the chicken in her face, and she looked away. I may have to do this a few more times to get the lesson sunk in thoroughly, but I think she's teachable. Dog wrasslin'. I reeeeeaaaaly hope the security cameras on the property have recorded over that morning's takedown already. The Twain is Meeting! The younger geese are starting to hang out with the older geese, and vice-versa. Billy-Bob the gander prefers to hang out with the younger girls, but does his level best to keep all the ladies happy ("it's good to be the King!"). There's one mature female, however, who hasn't warmed up to the new girls yet. 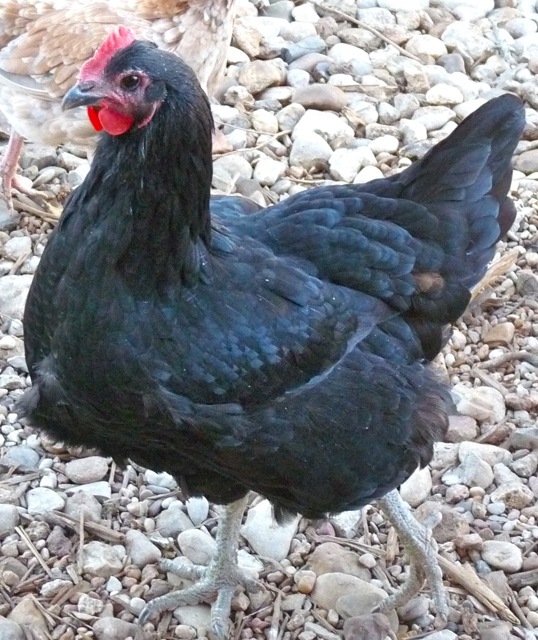 Duchess was broody & sitting when the youngers were battling it out with the rest of the geese. 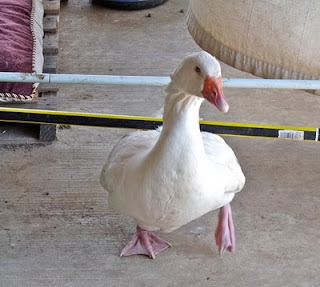 It finally got way past normal goose laying time, so I blocked off her access to the egg-laying shelters, which forced her to start socializing. Thankfully, Duchess is only giving the young ladies a nip now and then when they get too close for her liking. Miss Cecily, aka "Squeezlegoose": Today's vet visit showed minuscule weight gain. Her bodyweight should be thug-bruiser at this point - she's getting four tube feedings a day, along with all the game bird chow she can eat. Doc is wondering if liver function is impaired, as she's improving in all other areas (hooray!) but not putting on the pounds. As of today we're trying a daily dose of Denosyl® to help with liver function. [Denosyl® is SAM-e but formulated for dogs & cats, and has been off-label used for avians for awhile now.] It could take up to thirty days for any effects to show, but am keeping fingers and toes crossed. 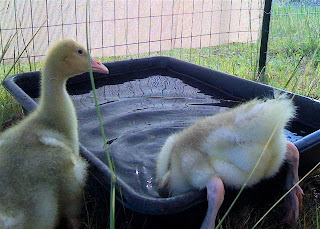 Four force-feedings a day - prep and goose wrangling - is hard work. 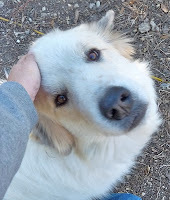 In the meantime, her stamina and energy are improving, and she's following Spouse and I around the house like a puppy dog. She grunts in front of the refrigerator when she wants something to eat. She'll even poke her head into the 'fridge if the door is open. She doesn't quite have the coordination to pick up greens off the ground yet, but if you hold a leaf of lettuce in front of her face, she'll tear into it like it just insulted her mother. 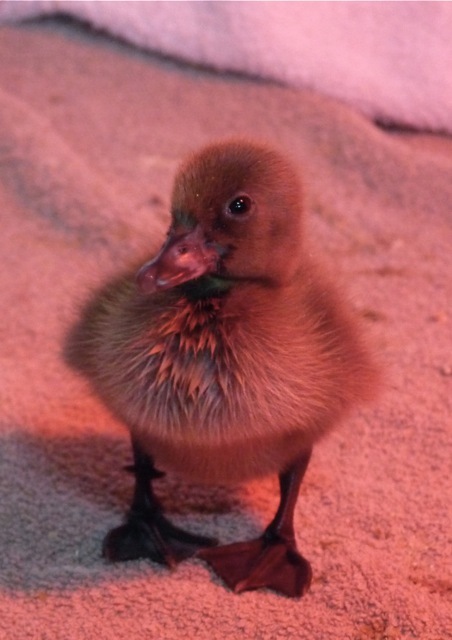 Her beak and neck strength is fierce; just ask the hapless tube she attacks at every feeding. And she's finally developing the coordination and flexibility to scratch the side of her face! If progress keeps going at this pace, we can boot her out of the house by late Fall. I'm sure she'd prefer the company of other geese rather than us smelly humans, although I might still pick her up for a hug now and then. Momma loves her goozle, yes she does! We changed her smoothie recipe about a month ago when she lost more weight. We've worked this recipe out with our vet, but I'm posting here for your information - always check with your vet before force feeding your goose with an annoying rubber tube four times a day. In a one-quart mason jar, put in the greens and fill almost half the jar with water. With a stick blender, grind the greens in the water until the water is a goodly green color. Strain the liquid through a mesh colander or cheesecloth, squeezing out any remaining liquid from the ground up greens. Set aside liquid. (If you like, save and use the leftover ground-up greens in soups or human smoothies). Combine the game bird chow, gluco/chron tablet, and probiotic powder. Pulverize in a coffee grinder or food processor until the mix becomes a powder. Put into clean mason jar. Miss Cecily gets about three ounces of smoothie at each feeding, so this ends up making about 10 servings. Ugly plants don't sell, and that's a fact of life at a garden nursery. Some of the plants with the shortest beauty & shelf-life are vegetables, especially tomatoes. Tomatoes grow fast and gangly real quick, and when they're just too far gone to re-pot them, management directs us to toss 'em or take 'em home. 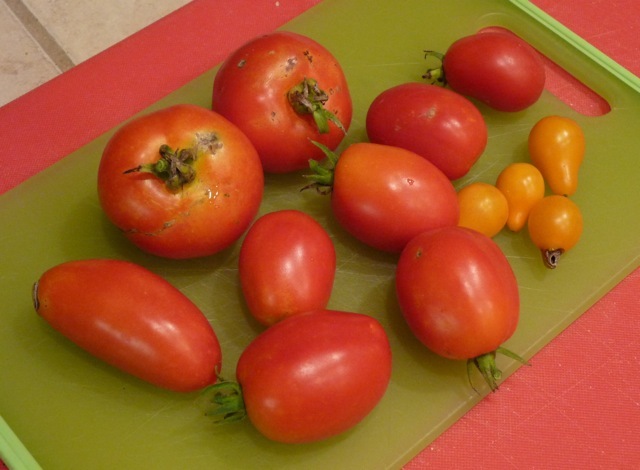 Although I already had about a dozen tomatoes planted, I went ahead and volunteered to take a half-flat of tomatoes a few weeks back. Hey, they were free! The tomato plants sat on a back porch rail, and were buffetted by rain and wind, knocked off the railing, and taste-tested by the geese a few times before I had time to get them planted. At that point, all the markers denoting what kinds of tomatoes I had were long gone. I think the new plants are Green Zebras, Celebrity, Better Boy, and Yellow Brandywine, but I'm not positive. So come July, we'll just have a nice big pile of "Tomato Surprise!" P.S. Did you know? Take a gangly tomato plant, snip off its lower leaves, and plant it deeply into the soil to where not only are the roots in the soil, but the stem and covering the snipped off lower leaves as well. Doing so, the plant will then develop new roots where the bottom leaves were snipped off, and be even stronger for the growth of a deeper root system. Learned that from one of the horticulture staff. Pretty cool tip! 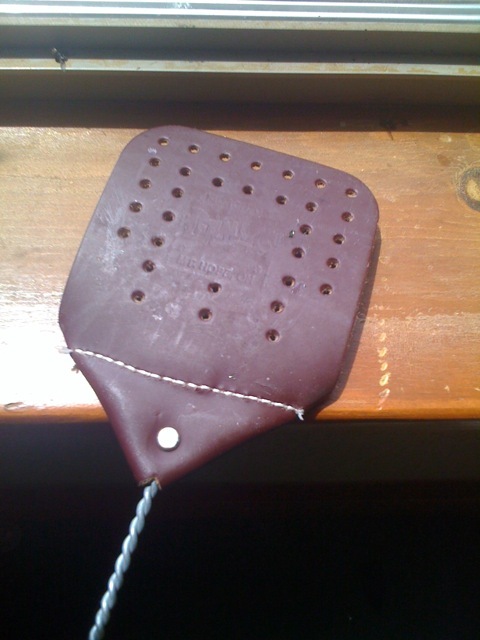 @dasparky: Dear flies: while you're in my house, know that I don't want you to suffer. I just want you to DIE. Sincerely, me. I recognize the worth of flies in the ecosystem, the cycle of life. 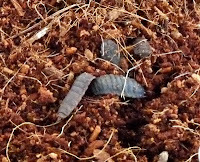 They play a very important role in decomposition of various materials, and their young are a food source for other animal species. In fact, as I've mentioned here before, we don't even own a can of bug spray in the house. We catch and release as much as possible. Flies, however, are not amenable to "catch & release", and act like a herd cats when attempting to shoo them out a window or door. Just. Ain't. Happening. Spouse and I have gone through numerous plastic flyswatters. None lasted more than a month or so before breaking. Terro has an aluminum mesh flyswatter which lasts much longer than the plastic ones, but uses a sewn paper border which frays quickly. Once the paper frays, the mesh starts to unravel with further swattings. Leather - it ain't gonna break. Repairable - I can hand sew it back onto the wire handle if the thread wears out. 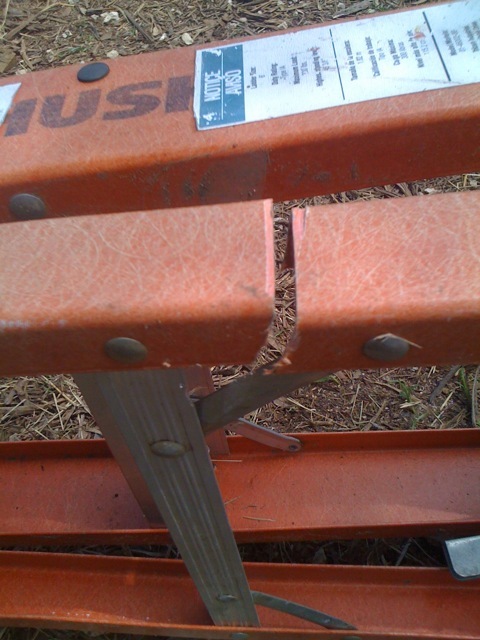 Wire handle - can be replaced with a twisted, thick wire hangar if need be. Leather is only tanned & smooth on one side. The other side is "raw", so fly guts don't clean off as easily. The swatter is $4.95, and dang well worth the money. We bought two. What can I say, we’re a couple of geeks. “Beta” was the big box hardware store 10'x10' shed, delivered in a flat pack. Version 1.0 was the strengthening of the shed infrastructure with additional lumber, plus the initial modifications of doors, roosts, and added windows. 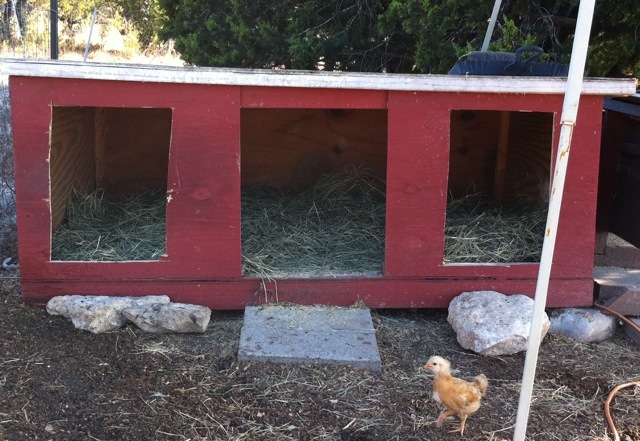 Version 2.0 is the current Hen Haus as it stands. Doors: The original shed doors are solid - well, as solid as pressboard and 2x3's (original hardware) can be. We added latches to the outer shed walls to attach & keep the outer doors open when desired. On the inside entry right is a recycled screen door; had to shorten it to 70”, then used hardware cloth instead of regular screen cloth for durability. The second screen door on the left was made from scrap lumber and various pieces of hardware cloth remnants. There’s a small entrance in the bottom middle of the left door; we’re hoping it's small enough to keep our egg-poaching dogs OUT. If not, easy enough to put in another piece of wood to make even smaller - it would still be plenty big for the chickens to get through. Anyhow, the screen doors swing outwards as well, so the sawdust litter stays in place, and we can easily sweep everything out when it’s time to clean. The inner & outer doors latch snugly together in various configurations, to guard against predators trying to squeeze into the coop from this direction. 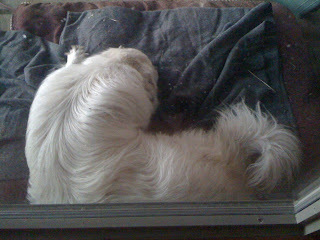 Windows: the window covers flip down, as there’s no easy way to have the covers open & stay upright. Plus, with the strong winds we get around here, making the covers into some sort of awning is just asking for them to be ripped off the building, I kid you not. The window openings were cut open with a Sawz-All, and the cut-outs were attached and reinforced with wood, hinges and latches. The window openings, like the screen doors, are also covered by hardware cloth - more expensive than chicken wire, but much sturdier. 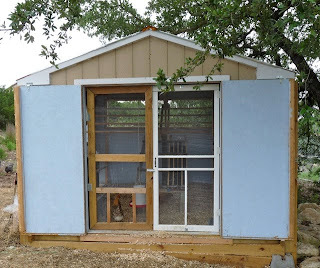 The windows that go across the length of the back of the coop face South. The wall that has the smaller windows face East, which is the same side that has the second (main) entrance. Main Chicken Portal: this is the entrance where we let the chickens out in the morning, facing the Eastern rising sun. Currently a manual opening system, but Spouse has plans & parts for a solar-powered automated door (which I’ll make sure he posts when the project is installed). 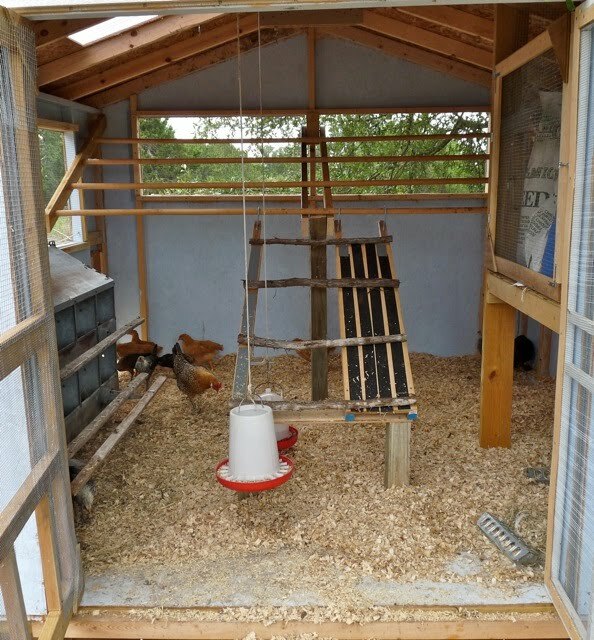 Inside... Roost & Ramp: the roosts are made from pine rounds (look like closet poles, but less expensive). 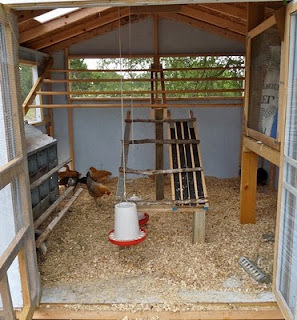 They thread through 2x4's on the sides of the coop, and are supported in the middle by 2x4’s, attached to a 4x4 upright that is toed-in to the floor. 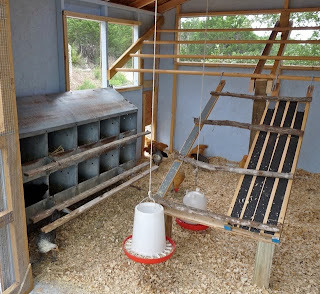 The ramp & “young chicken” roost below the main roost is one piece. 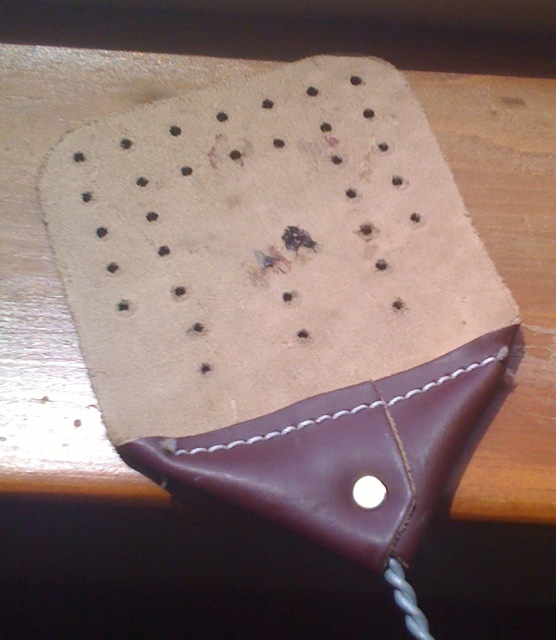 It is removable for cleaning, and connects to the main roost via rubber-coated bicycle hooks. Non-skid tape was used on the ramp, and cedar branches roosts. Legs are 4x4’s. A skylight was cut out of the roof on the East (left) side, and covered with a piece of blue-tinted corrugated roofing. This will provide additional light in the Winter, when the girls are inclined to lay less during the shorter days. It also keeps the inside from looking gloomy. All things in beauty for the ladies! Laying boxes: picked up a ten-cubicle laying unit at a roadside antique store for a third of what we would have paid for new. 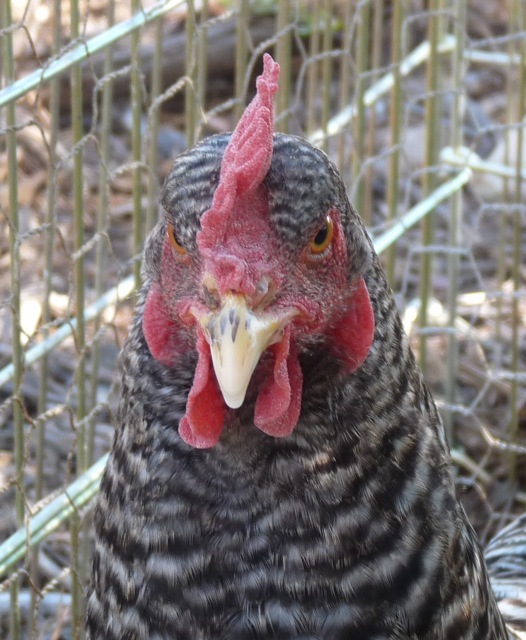 The cubicles are roomy: even the Jersey Giant hens have no problems sitting comfortably inside to lay. You can see the east-side entrance in the back. Food & water: hung from ropes attached to the ceiling, and with the food/water containers attached to the ropes via spring hooks. Easy-peasy to remove/refill. 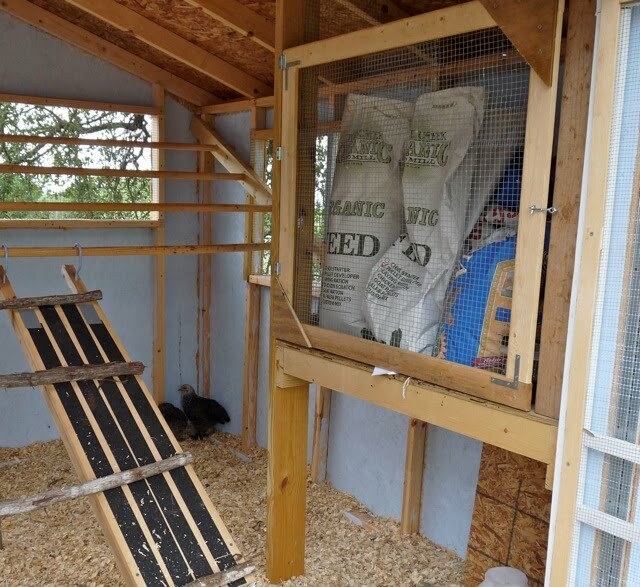 Feed storage: on the right of the coop is where the feed is being stored. Still trying to decide if we want to put metal cans beneath the cabinet space for open bags of feed. 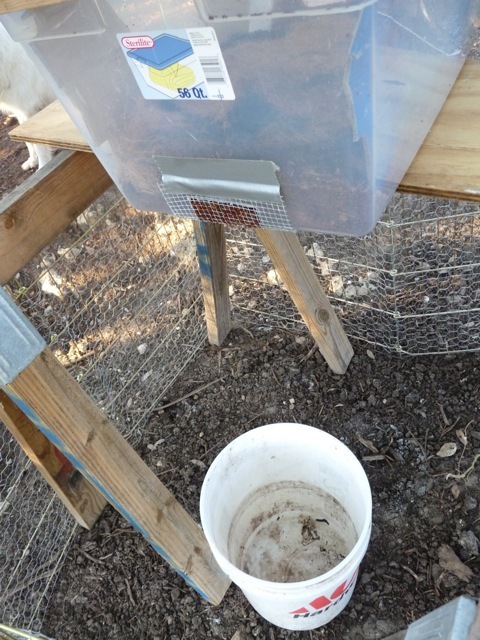 That same space could also be used for a chick brooder, or to store bags of pine shavings for floor litter. There's a screened door covering the feed cabinet, but there’s also still enough room on top for one particularly determined pullet to fly up & roost. We’ll need to put a wide piece of wood across the top opening to keep her from doing so. Rainwater gutters, with water directed into an aboveground metal cistern. 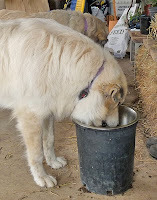 Rainwater would be used for the animals - much nicer tasting than our mineral-heavy well water. Mmmm, cloud juice! Pergolas/arbors on the East and South sides of the coop, with deciduous vines. This would keep the coop nice & cool in the Summer, but allow sun to warm the coop in the Winter when the vine leaves drop. The vines could be grapes, honeysuckle, or maypops/passionflowers. 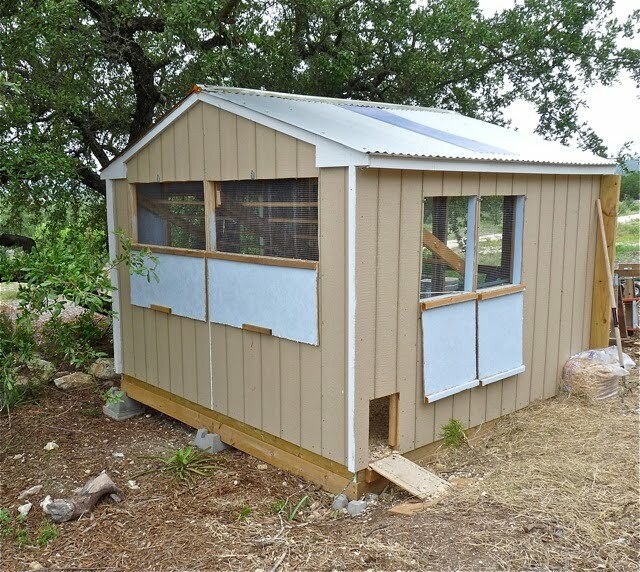 Between Spouse’s construction know-how, Uncle’s assistance, and my over-engineered projects, this ticky-tacky shed has turned into one solid coop. And now, after all this construction, I want a compound miter saw. Serslay.